My last journal entry was on the same date a year ago… and the one before, two years ago on the date. I survived the latest EOTW on the 21st of December 2012. And what an end that was! Luckily, the old habits survived too and people are still Christmas-ing. Not to miss the occasion, I wish from the heart to all Redbubllish Redbubllians a Super Merry Christmas full of Joy and Happiness. A big wish from the heart to all the wonderful RB friends for a very Merry Christmas and a wonderful, creative, full of joy, happiness and a most prosperous New Year 2012. May God bless all of you with your heart’s desires. Stats: One in three people who read my message left a comment. That`s pretty awesome. Thank you. Wishing all RedBubblers and their associates in spirit and vision a Wonderful and Happy New Year 2011 in good health and prosperity with blessings at every corner along your journey. May that this new year make a reality all your wildest (at heart) dreams and shower you with creativity, inspiration, new friendship and peace of mind, as you so much deserve. 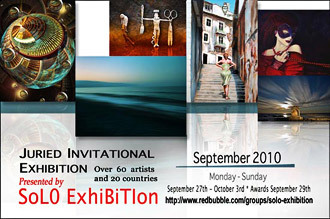 I am very excited to have my art selected, from over 49000 works of art, to exhibit in SoJie 8. SoJie 8 takes its name from the Solo Exhibition group’s Juried Invitational Exhibition. This month is only the 8th one, ever, and 100 other artists, besides myself, are represented. Winners of the invitational will be announced on October 27th, when a 1st, 2nd and 3rd place will be awarded in three categories: digital art, photography, and traditional art. EXCITED: Click my button and get into the ring of talent! I am very excited to have my art selected, from over 46000 works of art, to exhibit in SoJie 7. 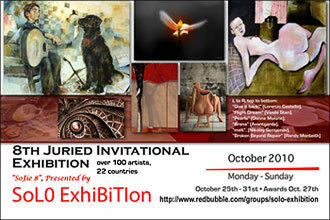 SoJie 7 takes its name from the Solo Exhibition group’s Juried Invitational Exhibition. This month is only the 7th one, ever, and 73 other artists, besides myself, are represented. Winners of the invitational will be announced on September 29th, when a 1st, 2nd and 3rd place will be awarded in three categories: digital art, photography, and traditional art. just stumbled upon a short movie (in Spanish with subtitles) on youtube that is so powerful in painting such a terrible story in only a few minutes… I still can’t get over it! Thank you, thank you from the heart dear anonymous friend, your committed appreciation made my day. And thank you all for taking the time to read this note of thank you. Wish you all an inspired and wonderful week ahead. 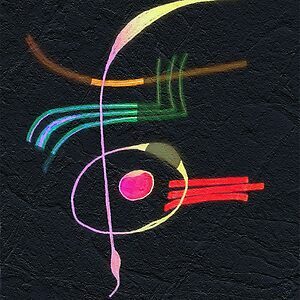 I’ve been asked many times how framing your artwork is done and I personally have my “templates” already created, but just a few minutes ago I read a journal entry Adding a framed image by “Tony Alexander” that seems to be very easy to follow. Hence, I’m just passing on this piece of info from our fellow Australian artist. In what it appeared to me like an out-of-the-blue kind and generous gesture, my dear RB friend Sibel has purchased a Random thoughts and guided feelings card, just a few hours after I have posted it. Thank you Sibel for adding to my day the beautiful touch of your genuine and committed appreciation of my art. You may never know how much it means to me. And a big thank you from the heart to all the wonderful artists here that take the time to visit, leave great comments and/or leave a loving stamp-of-approval by pressing the “favorite” button. 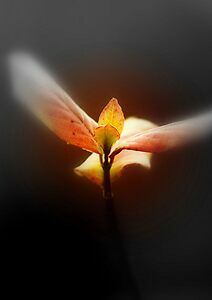 Your interest and kind appreciation is always humbly acknowledged.